The stunning sight, a springtime favorite on the pretty peninsula, is indeed magical. Ride your own magic carpet, or drive your car, if that's more your style, to Pacific Grove from "early April" through to "late May," for some amazing Magic Carpet time. 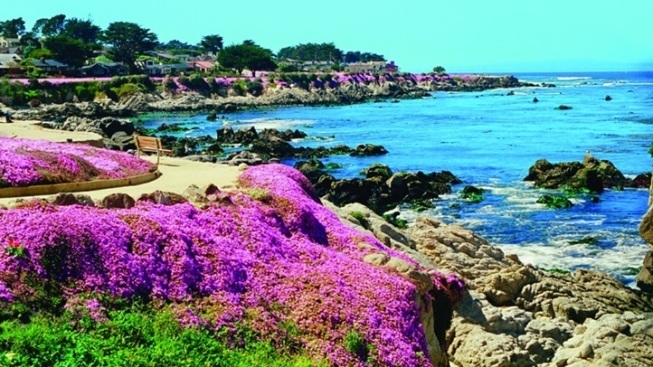 BEING RIGHT THERE, in person, to admire the magenta ice plant that blooms in the salty-air'd, ocean-close spots around pretty PG, is absolutely a must for any wildflower buff looking to complete a list of California must-sees. Call it magenta ice plant, call it Magic Carpet, or call it "drosanthemum floribundum," if you like, but don't spend too long deciding which name you prefer. For the yearly wonder is soon opening its purple-y petals for a limited time. ANNUAL WILDFLOWER SHOW... at the Pacific Grove Museum of Natural History. It's an event that's billed as one of the biggest in the "Northern and Western Hemispheres with over 600 species and varieties of wildflowers." The dates? Oh, you'll be in the happy thick of it, if you're on the peninsula to soak up those Magic Carpet moments. The Wildflower Show will enchant flower fans from April 19 through 21, 2019.